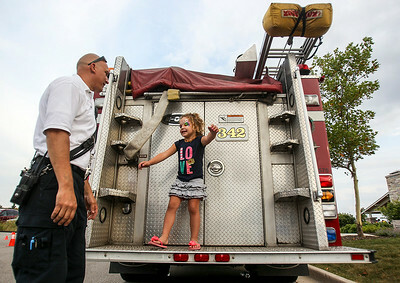 Sarah Nader- snader@shawmedia.com Lieutenant Chris Kopera (left) shows Olivia Hasan, 4, of Woodstock around a fire truck while Crystal Lake Police Department hosted National Night Out, a nationwide event providing an opportunity for the community and local law enforcement to come together to promote neighborhood spirit and police-community partnerships at Three Oakes Recreation Area in Crystal Lake Tuesday, August 5, 2014.. Activities included free face painting, balloon art, kids games, canine demonstration, dunk tank, bubble entertainment and police and fire rescue vehicles were display. 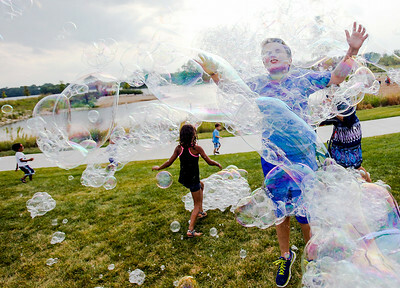 Sarah Nader- snader@shawmedia.com Jason Golly, 11, of Hoffman Estates runs through a huge bubble while Crystal Lake Police Department hosted National Night Out, a nationwide event providing an opportunity for the community and local law enforcement to come together to promote neighborhood spirit and police-community partnerships at Three Oakes Recreation Area in Crystal Lake Tuesday, August 5, 2014.. Activities included free face painting, balloon art, kids games, canine demonstration, dunk tank, bubble entertainment and police and fire rescue vehicles were display. 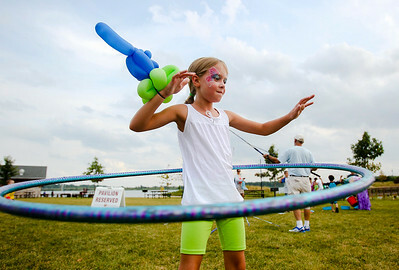 Sarah Nader- snader@shawmedia.com Isabel Boksa, 8, of Cary uses a hula hoops while attending National Night Out, a nationwide event providing an opportunity for the community and local law enforcement to come together to promote neighborhood spirit and police-community partnerships at Three Oakes Recreation Area in Crystal Lake Tuesday, August 5, 2014.. Activities included free face painting, balloon art, kids games, canine demonstration, dunk tank, bubble entertainment and police and fire rescue vehicles were display. Sarah Nader- snader@shawmedia.com Rhianna Petersen, 8, of Cary sits in a police car while attending National Night Out, a nationwide event providing an opportunity for the community and local law enforcement to come together to promote neighborhood spirit and police-community partnerships at Three Oakes Recreation Area in Crystal Lake Tuesday, August 5, 2014.. Activities included free face painting, balloon art, kids games, canine demonstration, dunk tank, bubble entertainment and police and fire rescue vehicles were display.